Rarely do I not have enough fabric for a sewing project. I am one of those people who usually errs on the side of excess when I am buying fabric. Sometimes, however, I buy a piece for which I have no immediate plans, and therefore, no real idea what I will end up making. This, of course, was the case when I bought my Pucci silk. Little did I know I would be making a dress, and hoping to line its accompanying jacket in the same matching silk. I dutifully measured and calculated and figured there was a good chance I could eke it out. I had two things going for me: the silk was 60” wide, and I knew I would be taking about three inches off the length of the dress pattern (and still have a nice 3” hem). But I also had two things going against me: I would need to do some matching of the design on the dress, which could prove interesting with a print that seemed to change both its color and motif on a whim. More concerning was the fact that the jacket has kimono sleeves. Kimono sleeves usually require more fabric than set-in sleeves. The vintage Vogue Designer patterns include a short statement about each featured designer on the pattern envelope flaps. 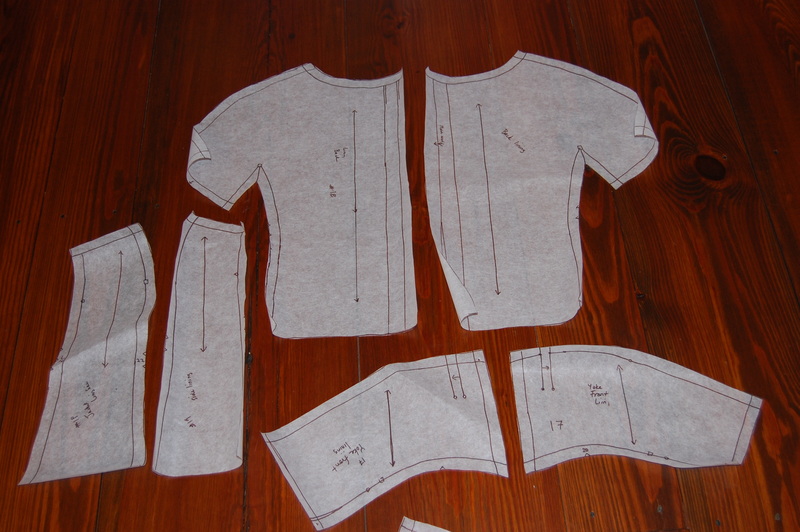 Take a look at the pattern pieces for the jacket. 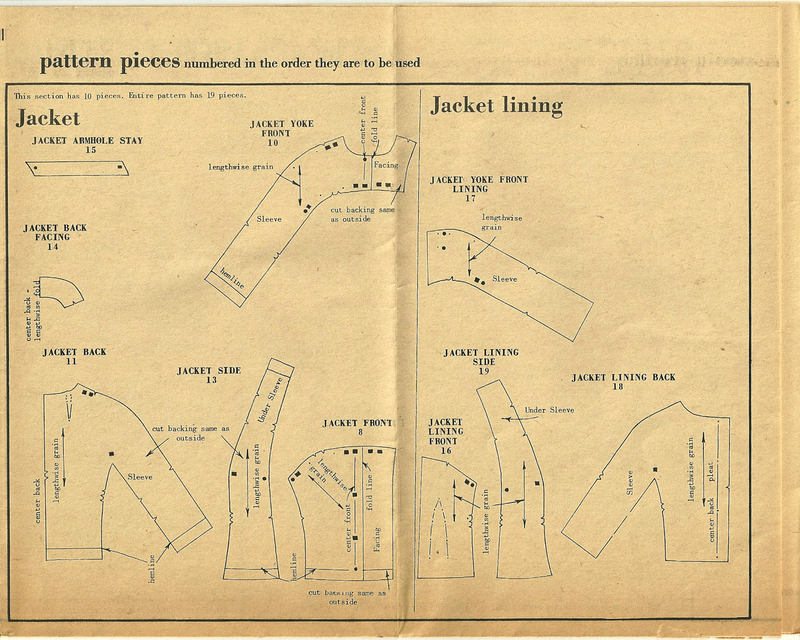 The jacket front (#8) is cut on the diagonal while the accompanying lining front (#16) is cut on the straight of goods, with a deep dart to accommodate the fullness for the bust..
Click on the image for a clearer view of the pattern pieces. Also, note the grain lines. Now take a look at the jacket side (#13). It is both the jacket side and the under sleeve at the other end. Sewing the muslin together showed me how ingenious this construction is – and I’ll show more about this in another post. But – back to that silk. Using my adjusted muslin as my pattern, I cut out the silk organza underling for the dress. So now I had all the dress pieces ready to place on the silk, spread out single layer on the dining room table. Then using the tissue pattern pieces for the jacket lining, I was able to eyeball my chances of having enough fabric. There was a thudding moment of truth when I knew in no uncertain terms that there was no way I was going to have enough fabric without making some change in plans. Where was Rumplestiltskin and his magical spinning powers when I needed him? Alas, I knew I would have to make my own magic to solve this problem! And I could see only one way to make this work. I would have to piece the sleeves so that the lower half of them – the part you can’t really see – were in another fabric, the logical choice being, of course, the black crepe de chine that I would be using to line the dress. When I took my new “chopped off sleeve-ends” pattern back to my silk, I was able to fit everything on, including matching the dress yokes to the body of the dress. I checked and rechecked all the pieces. Then I took a leap of faith and cut it out. Although I am currently working on the dress, I wanted to see how the “new” sleeves, with their pieced ends, would look. So, here is one lining back section assembled, with its lower sleeve end added to it. Am I positive this will work and not look glaringly – like I didn’t have enough fabric? Not really. I’ll know soon enough, however. 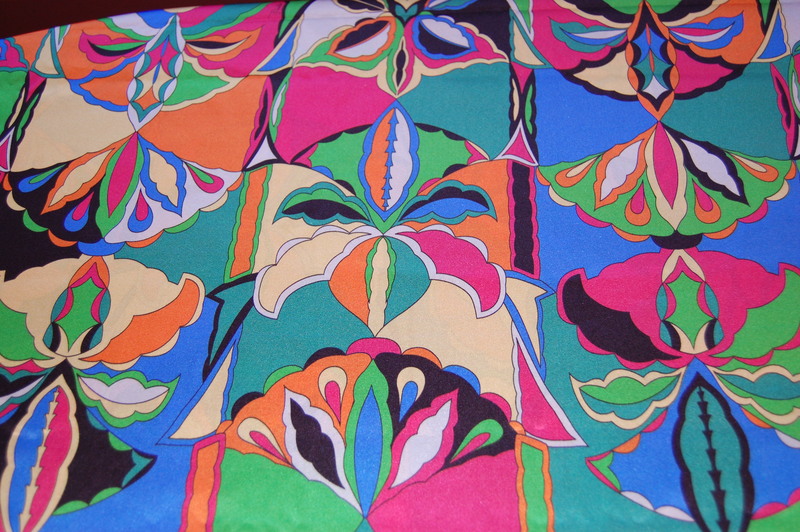 In the meantime, I am enjoying every minute I spend with this Pucci silk. Eat your heart out, Rumplestiltskin! Thanks for those closeups of the pattern pieces. Fascinating! It really is – and the inside construction of the jacket is also quite unique. I’ll show more in another post. You are so clever — and dliligent, Karen. As Tim Gunn would say, you’ve made it work. And I have no doubt that you will. Can’t wait to see more progress. Those designer patterns are so unique, which is what makes them so special! I love these designer patterns! I learned so much about sewing from using them when I was in my 20s – and I’m still learning from them. Happy Birthday, by the way ( a little belated)! I long ago claimed the title “Queen of Eke-ing” but you are at least a “Princess”! Great way to eke it out! I’m sure it will be wonderfully unnoticeable in the end. I can’t wait to see your finished outfit! I’ve always wanted to be a princess of something! Thanks for anointing me – and thanks for your words of support, too! Amazing fabric! Good on you for finding creative ways on making it fit. I think these little ‘challenges’ are so great because they push us to find creative solutions that often turn out better and more unique than if you would have bought enough! What a lovely way to look at this shortage of fabric! Thank you so much! I knew you could and would figure out a way. I hesitate to offer a suggestion, but was wondering whether you might have considered adding a small strip of the Pucci silk to the lining at the sleeve edge. No one will ever see the main part of the sleeve lining, which is why you were able to make it black, but a hint of the lining at the edge of the sleeve might show a little. A 1 or 2 inch strip, perhaps on the bias, could fill this small gap. Just a thought. I am always happy for suggestions, so thank you for it! I actually thought of doing just that – except for the fact that I don’t have enough fabric left even for that! I have a couple of longer, narrow pieces on the straight of grain, but not enough on the bias (and I just don’t want to get into piecing a bias strip…). The sleeves are quite narrow, so I am hoping that the lining won’t really show at the sleeve ends anyway. Great to hear from you again! Thanks, Geraldine! I think the colors in the fabric are quite captivating! It was a great solution to a tricky problem. I don’t think it will be noticed at all. Thanks, Lizzie – I hope you are right!